I came home after my holiday to learn that Celeste, my one remaining hen had gone broody. I’d been hoping this would happen but wasn’t sure it would as Celeste is not yet a year old. 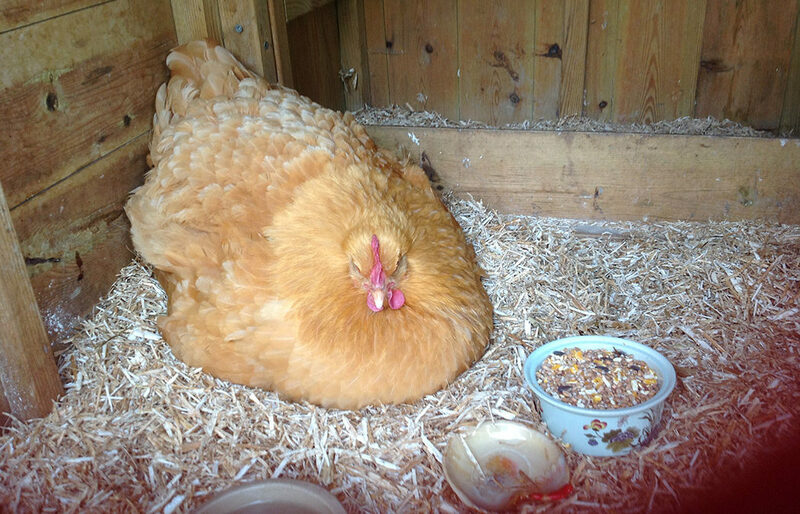 You may or may not know that when a hen goes broody not only does she lay and stay on the nest, but she’ll do this regardless of the viability of her eggs. As I don’t have a cockerel this could have been a very long wait! Luckily I knew where to get fertilised Buff Orpington eggs and slipped four of them underneath her as she sat patiently doing her stuff. In theory, the hen is supposed to come off the nest once a day to dust bathe, eat and relieve herself. As broody hens are extremely hormonal and don’t take kindly to interference, I’ve let the expert decide and so Celeste comes off the nest and into the garden when she chooses. This means I stand guard so that she stays safe whilst off the nest. I am an active and happy member of Team Chick. Incubation takes 21 days, so we’re now on a countdown to next Wednesday, marked as Hatching Day on the calendar. Although there’s no guarantee that any or all the eggs will hatch, I’m working on the ” build it and they will come” principle. Hence the organic chick crumbs, (chicks can’t digest full sized grains) and new feed dish that are awaiting use. Several times a day I spend a few quiet minutes with Celeste, praising her and telling her how wonderful it will be when whoever decides to hatch makes an appearance, very soon now.